2nd Annual Lennon Family Concert and Fundraiser This Friday! - Yo! Venice! Home Neighboring Communities 2nd Annual Lennon Family Concert and Fundraiser This Friday! 2nd Annual Lennon Family Concert and Fundraiser This Friday! 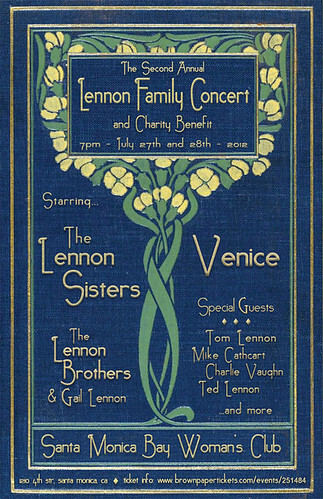 The 2ND Annual Lennon Family Concert and Fundraiser will be held this Friday, July 27th, at the Santa Monica Bay Woman’s Club starting at 6pm. 21 tickets remain on sale as of today. The evening will feature a night of music and harmony with the famous Lennon Sisters, Venice the Band, The Lennon Brothers and Gail Lennon, Ted Lennon, Charlie Vaughn,Tom Lennon, Laurie Lennon, Mike Cathcart, Vaughn Montgomery, Jackie and Tim Lennon and many other talented cousins. This event will benefit Artists for the ARTS Foundation (dedicated to keeping art programs alive in our local public schools), My Stuff Bags (for children entering foster care), B.R.A.I.N. (support for Traumatic Brain Injury patients and families) and with a donation to the Santa Monica Bay Woman’s Club.